Aurealis Audio's UPOCC copper speaker cables have been re-designed with a view to keeping retail prices down and not compromising performance. After several months of design and testing, the universal 4-wire braid has shown that it can deliver exceptionally high quality results at the best value for money price. As with all Aurealis cables, this new approach delivers excellent transparency and clarity of detail across a broad frequency. The 4-wire construction provides for both low capacitance and low inductance, and very good EMI/RFI rejection due to its cancellation of magnetic fields. The use of solid core UPOCC* copper in teflon insulation results in lower resistance and a faster cable compared to comparable cables constructed of standard multi-strand copper. Capacitance, inductance and resistance figures are given for each model. The new speaker cables are available in two sizes, determined by the gauge of wire used. 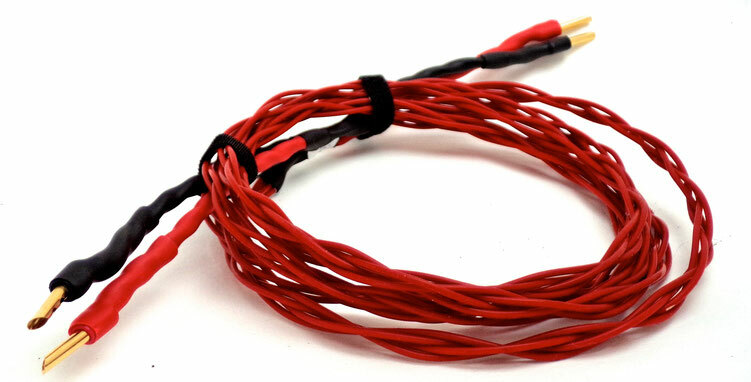 The Aurealis S420 uses 4 x 20 awg strands of wire and the Aurealis S418 uses 4 x 18 awg strands of wire. These gauges have been chosen for the broad frequency range they provide compared to many other cables. For best performance, Aurealis Audio does not recommend constructing speaker cables of solid core wire or multi-strand wire where the individual wire used is thicker than 18 awg. Roll-off effects become audible with gauges as thick as 16 awg and lower, and will result in loss of transparency and detail at the top end. For example, a multi-strand 14 awg cable (where all the strands are not insulated from each other) will begin to roll-off off at 6.7 kHz, and a solid core cable of 12 awg will demonstrate roll-off at around 4 kHz. ** In addition, the bass becomes less precise with thicker gauge wires and more boomy. Multiple strands of thinner wires are the way to keep top end detail and a precision bass end. * UPOCC = Ultra Pure Ohno Continuous Cast. Wire is designated as 99.99999% purity by the Neotech factory. Comprised of 4 interwoven strands of solid core 20 awg UPOCC copper in each channel, 2 strands for the positive terminal and 2 for the negative. Can be used with single terminal speakers or dual terminals (free jumpers provided). Current capacity for peak performance: 3 amps, making this cable suitable for up to 70 watt amps into 8 Ohm speakers or 35 watts into 4 Ohm speakers. (Subject to speaker manufacturer's recommended specifications. For further information, please see Section 4 below.) But can be safely used with amps of higher power. Recommended length: As short as possible is always good, but for 8 Ohm speakers theoretically runs of up to 25 metres are possible. For 4 Ohm speakers 12 metres. (Assumes speaker cables should always be less than 5% of speaker impedance). Comprised of 4 interwoven strands of solid core 18 awg UPOCC copper in each channel, 2 strands for the positive terminal and 2 for the negative. Can be used with single terminal speakers or dual terminals (free jumpers provided). Current capacity for peak performance: 4.6 amps, making the Aurealis 418 suitable for up to 150 watt amps into 8 Ohm speakers or 75 watts into 4 Ohm speakers. (Subject to speaker manufacturer's recommended specifications. For further information, please see Section 3.) But can be safely used with amps of higher power. Recommended length: As short as possible is always good, but for 8 Ohm speakers theoretically runs of up to 40 metres are possible. For 4 Ohm speakers 20 metres. (Assumes speaker cables should always be less than 5% of speaker impedance). Advice on standard bi-wiring is provided in Section 2. 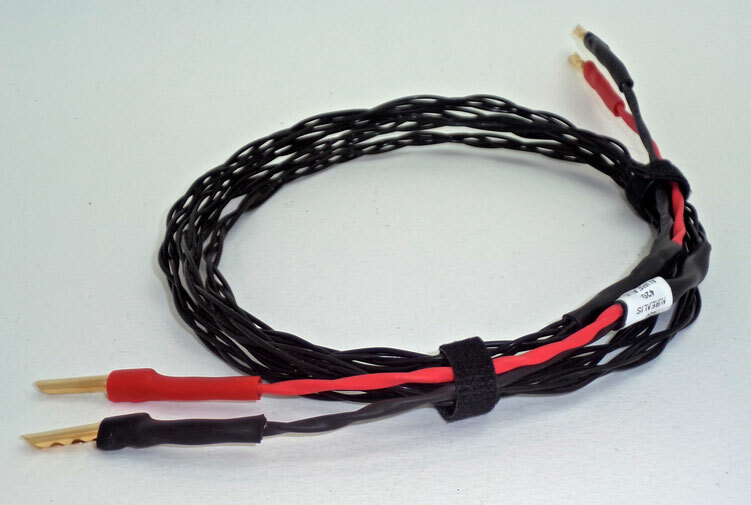 For people seeking to bi-wire their speakers, Aurealis Audio recommends running two pairs of speaker cables. One to the HF (high frequency) terminals and the other to LF (low frequency terminals). This approach results in lower capacitance and inductance. Removing speaker jumpers and running two sets of cables to your speakers may offer improvements in clarity and imaging. However without the jumpers in place very little extra power will be delivered to the speakers overall. This is because the speaker drivers used for the low frequencies will always pull the majority of power from the amplifier. The following standard bi-wire options are available for speakers with LF and HF terminals. Section 4 below.) With jumpers in place the current capacity for peak performance is 6 amps (Section 3 below). Please note, for bi-wiring from an amplifier with a single set of speaker output terminals, one cable should be chosen with spade terminations at one end and the other banana plugs. At the speaker end either spades or banana plugs can be chosen for both cables. A set of Aurealis speaker jumpers will be provided free of charge for these options for those who may wish to try out versions of the power options discussed in Section 3. For lower watt amplifiers, the speaker manufacturer's recommendations on the power needed to drive the speakers must be considered. In some cases the speakers may not have enough sensitivity (measured in db) for lower watt amplifiers, and better results may be achieved by improving the compatibility of components before upgrading speaker cables.